With the holidays over, it’s time to turn a critical eye to body shapes. No not ours, our pets! The APOP (Association for Pet Obesity Prevention) reported in 2016 that over half the dog and cat populations are overweight. Obesity is defined as a body weight of 10 – 20% above the ideal weight. When checking your pet, a good guide is to lightly pass your hand over your dog’s or cat’s ribs and shoulders. You should be able to easily detect the ribs and bones. If you have to press in to find them, then your pet is most likely overweight and you should consult your vet. Additionally, viewed from above, you should be able to see a tuck-in at the waist. Obesity has become a leading health risk for our pets. You might ask, what harm can a few extra pounds cause? 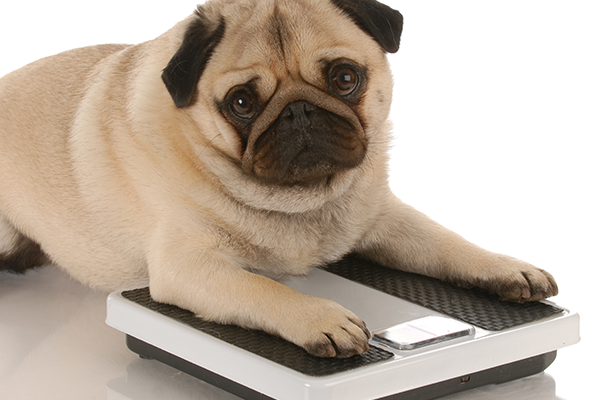 Consider this; added weight can increase the likelihood that your pet can become diabetic. Excess weight can also lead to osteoarthritis, heart disease, liver disease, high blood pressure, and cancer. We alone control the intake of food and the amount of exercise our pets receive. And since many of us equate food with love, it’s time to realize that feeding or treating excessively is shortening our pets’ lives, and not exercising our pets exacerbates the problem. So what can we do? Step 1: Consult with your vet and give your pet a thorough exam including blood work. While most dogs and cats become overweight due to overindulging, some may have developed an endocrine disease such as hypothyroidism, an insulin imbalance or Hyperadrenocorticism. For these pets, simply reducing calories and increasing exercise can be detrimental to their health. Once physical causes for the excess weight are ruled out, you can begin a weight loss program for your pet. By talking to your vet and identifying the problem, you can start taking the right actions to improve your pet’s health. Step 2: Feed less! Feed less than the manufacturer recommends, feed less if you feed treats throughout the day, and feed less starch. Below is an example of a feeding guideline from one of our dry foods: 40 – 60 lbs = 2 1/8 – 3 cups. So, based on a 45 lb dog (45 lbs being the ideal weight and not what the dog currently weighs) this range suggests that you feed about 2 1/3 cups daily. At 409 kcals/cup, as listed on the bag, that would be about 953 calories. That is simply too much food! I suggest that you reduce that amount by 10% to start, and then, reduce the amount again based on activity level…and I don’t mean how much they play outside in their yard by themselves. Most of our dogs lead a pretty sedentary life, so reduce the already 10% reduction by another 10 – 15% based on activity level and the age of the dog. So now we’re at around 770 calories. If you treat throughout the day, and depending on the calories in each treat (please do find that out), you will need to reduce the calories fed at meals by the calories you feed as treats! In some households that can be as much as 50% of their diet. In part 2 we’ll discuss the types of foods to feed for weight loss!